THE COMPLETE ORIGINAL SERIES - Digitally Restored and remastered from the historic albums. A Five CD Box Set. 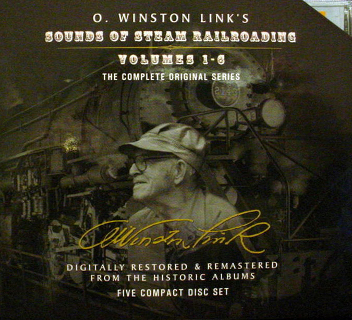 This series, a collection of sounds of mixed and mainline trains pulled by steam locomotives on the Norfolk and Western Railway, was recorded by the late O. Winston Link in the twilight of the steam era. The set, housed in a handsome slipcase, compiles the originally released five LP albums and one 45rpm. Each disc features the original liner notes in a new 28-page booklet with Link’s photographs, some previously unpublished! Link’s sound recordings, as presented here, are part of a select group of 50 that the Library of Congress recently added to it’s collection, representing historic cultural events covering almost a century. O. Winston Link’s most popular LP record, originally recorded in 1957 and 1958, is available on Compact Disc. This long unavailable work, recorded on board Norfolk and Western trains and trackside includes more than 80 minutes of stirring sounds. This CD includes: Winston Link’s most famous recording; the Christmas Eve arrival in Rural Retreat, Virginia, of Train No. 42, "The Pelican", as Christmas music chimes out from the nearby Lutheran Church. This incomparable recording, digitally remastered, is accompanied by a 28-page descriptive book containing many of the best photographs made by the late Winston Link.